Wow...is that near your area? Yeah. It got about 15 miles from me I think. Welcome to meteorological winter. Here is the unofficial summary for the month of November 2018. It was a cold and snowy month all across western and central Michigan. At Grand Rapids the mean of 34.6° was the 10th coldest November on record. The maximum for the month was a new record coldest at 52° the low for the month was 20° there was 14.4” of snow fall that is good for 17th place. At Muskegon the mean for the month was 35.5° that is good for the 7th coldest on record. The highest reading was just 51° and that is good for a new record coldest maximum. Muskegon reported 12.5” of snow fall. At Kalamazoo the mean of 34.6° is good for the 5th coldest on record there. The warmest it got in Kzoo was just 54° and that is good for the 2nd coldest on record there. And at Lansing the mean was 33.6° that is good for the 9th coldest on record there. The warmest reading all month was 53° and that is good for the 2nd coldest maximum in recorded history. They had 11.9” of snow fall that is good for 13th place. Should be noted that records have been kept at Lansing since 1863. A November to Remember for many of us in the heartland, esp when you look at how much real estate was under the grip of early Winter cold. 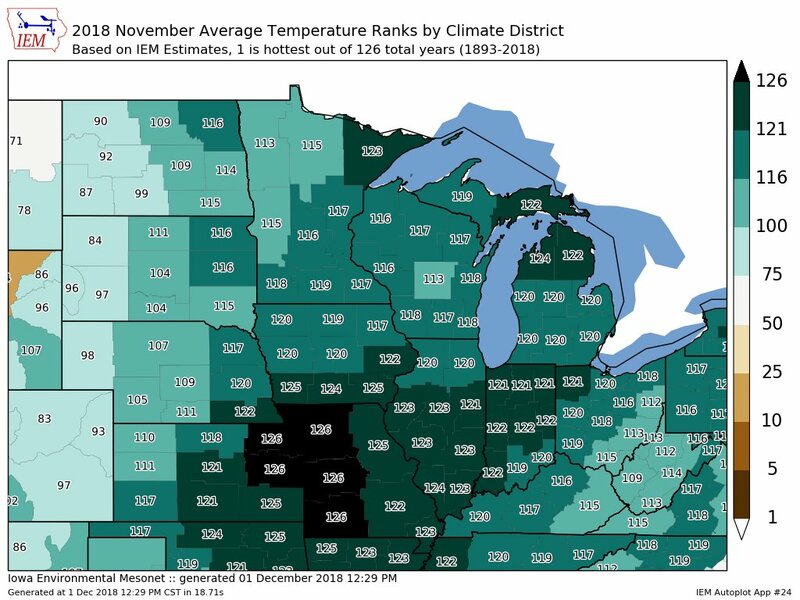 Parts of NE KS/W MO had their coldest November on record. Thank you for sharing that. That was a ridiculously cold November. Anyone ready for "Decanbruary" weather? We limped our way into the Top 10 in terms of snowfall here. We got 7.2" over the month, which ties the amount we got in our lowest snow season on record, and is good for 9th all time in November.